General Richard. B Myers, USAF ret.,15th Chairman of the Joint Chiefs of Staff, was in Dallas to present the award to the law firm for its support of veterans in the school that bears his name. The school readies veterans for employment in only 5 months and helps place them in well-paying careers in the fast-growing healthcare industry. Dan Butcher, Strasburger Managing Partner, and General Richard B. Myers, USAF ret. “Strasburger is privileged to support the important mission of creating viable job opportunities offering the potential for a lifetime of increased earning power for veterans," said Strasburger Managing Partner Dan Butcher. Retired Air Force General Richard B. Myers, 15th Chairman of the Joint Chiefs of Staff, was in Dallas on February 2nd to present the second annual General Richard B. Myers 2016 Veterans Hope Award to Strasburger & Price, LLP for the firm’s generous support of US veterans through the school that bears his name. The General Richard B. Myers Veterans Biomedical Technology School, located at Dallas-based MediSend Institute of Biomedical Technologies, trains post 9/11 veterans to be professional biomedical equipment technicians (BMETS), the individuals responsible for the repair and maintenance of critical medical equipment. It is a growing field with excellent starting salaries and good career upside in the healthcare industry. The Myers School readies veterans for employment in only five months in a fast track program. Graduates are currently working for prominent healthcare organizations around the country such as Baylor Scott & White Health, SODEXO, DaVita Dialysis, VHA, Becton Dickinson, and the US Military. Strasburger has been a major sponsor of MediSend with legal and financial support as the organization has grown from a small humanitarian organization founded in 1990 to an educational institute including the General Richard B. Myers Veterans Biomedical Technology School and the MediSend International Biomedical Technology School. 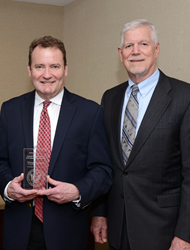 Dan Butcher, Strasburger’s Managing Partner, accepted the award on behalf of the firm at a ceremony held at the Strasburger offices in downtown Dallas. “Strasburger is privileged to support the important mission of creating viable job opportunities offering the potential for a lifetime of increased earning power for veterans. We are honored to partner with MediSend and General Myers in this endeavor,” says Butcher. The Myers School recently partnered with Dallas County Community College District to offer the training as part of an accelerated Associate Degree in Electrical Engineering Technology. Veterans can complete their degree at DCCCD colleges while fully employed as BMETS. "The ability to earn a BMET certificate in five months and complete an associate degree while employed is an exceptional opportunity for our veterans, many of whom are challenged in the transition from military to civilian life,” said General Myers. All tuition and fees have been privately funded since the launch of the General Richard B. Myers Veterans Biomedical Technology School in 2013. MediSend President and CEO Nick Hallack credits organizations such as Strasburger, ReserveAid, Hillcrest Foundation, Zale Foundation, Hawn Foundation and Orix Foundation with the growth and success of the school. On April 1st 2016, the program will be approved for Post 9/11 GI Bill benefits. MediSend projects 26 veterans in 2016 in three classes, increasing to 36 veterans for 2017. For more information on the General Richard B. Myers Veterans Biomedical Technology School, go to http://www.MyersBMET.org .